Sunset Paradise is a beautifully decorated westward facing prow front cabin that is less than 5 minutes from Downtown Blue Ridge. 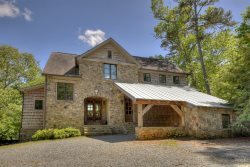 Situated on a 1.5 -acre wooded lot with an amazing mountain view of the Cohutta Wilderness. Walking in from the covered porch you will find a soaring vaulted ceiling and floor-to-ceiling windows framing an amazing westward-facing mountain view. The great room and large open floor plan are perfect for relaxing or entertaining friends and family. Included are 40-inch flat panel TV with cable TV, wireless internet and DVD player. The sitting area has a large sofa rocking chair and a gas log fireplace. The dining area a bar height table with seating for 6. The breakfast bar is also available for additional seating. Sleeping arrangements have been well thought out for a family getaway. The entry level has a bedroom with a queen bed and a large bathroom. The upper level has a large bedroom with a king bed and a private bathroom with a walk-in shower. Waking up, you will look through a window and the footboard of the bed. This picture frame window frames up the triangular windows and long range mountain and valley view. On the lower level, you will find a large bedroom with a full bed and a twin bed. The large game room has a queen sized sleeper sofa and shared access to a bathroom with a tub/ shower combo. This cabin presents an amazing value that is close to town and packed with amenities! Located 5 minutes from Downtown Blue Ridge shopping on a large wooded lot with an unobstructed long range mountain view of the Cohutta Wilderness. King bedroom, Cable TV, private bathroom with single vanity and walk-in tile shower. The game room has a large queen sleeper sofa, sofa chair and 32" flat panel TV with Cable TV, DVD, Shuffleboard table, foosball coffee table, and game table. Plenty of board games and DVD collection are also available. Check in was quick, staff was courteous and knowledgeable. Cabin was awesome. Well be back. In fact we are already considering another visit for next summer. We would like to stay on Lake Blue Ridge or on the Taccoa. All of your staff is quite friendly and accommodating. This is my second time staying with Southern Comfort, and your staff is part of the reason. We loved the cabin. We truly felt at home. I think I dealt with Ashley most of the time. She was friendly, answered my questions, and didn't seem to mind the questions. We will definitely be back. We have stayed at several other properties during our annual spa trip. We like Sunset Paradise the best. It met all our needs, including it's location to Blue Ridge. A very easy drive to our favorite spots in town. From the better staff members were very courteous and respectful. I had never done a cabin trip before, and every agent I spoke with whenever I called would advise me on the best cabins suitable for what I was looking for. Overall my stay was amazing. I wished I had booked it for a longer timeframe. While booking, Southern Comfort was excellent when answering questions, making suggestions, etc. Booking was simple! After getting to the office, I was even more pleased to have chosen Southern Comfort. The staff was great and the location was near our property. Everything was amazing! I would definitely do business with this company again!! The property we stayed at was amazing! Our family loved the cabin, Sunset Paradise! It was well-kept, super clean, and the view was amazing! The cabin was well-equipped and centrally located to tubing, rafting my, hiking, shopping, dining, etc. We will definitely be back! Beautiful property, very well maintained and perfectly located. Amazing views. Staff was extremely helpful with booking questions and also helpful during check-in. This was our first visit to Blue Ridge. Southern Comfort Cabin Rentals helped in making the experience a memorable one. I'm happy I choose Southern Comfort for my rental. I was pleasantly surprised with the cabin. It worked out perfect for our group. Awesome view! We all had a wonderful time and hope to return again soon. Amy was such a pleasure to work with. Friendly and knowledgeable. We had a wonderful stay. Sunset Paradise was absolutely beautiful. Full of amenities and such wonderful view. We will definitely return soon. The cabin exceeded our expectations - it was fabulous! Everyone is so friendly and willing to help. Love staying with you!! The cabin was so peaceful and relaxing!